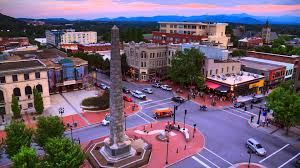 Asheville NC, located in the heart of the Blue Ridge Mountains, is a vibrant town known for its exhilarating outdoor adventure, cultural and fine arts, iconic landmarks, incredible dining and equally incredible craft brew. If you’re planning a trip to this mountain oasis you’ll find it’s near impossible to pack everything there is to see and do in Asheville into one trip. To make the most of it, here are five can’t miss experiences guaranteed to leave a lasting memory for you and the family. No trip to Asheville, NC, would be complete without exploring the 8,000-acre estate of Biltmore, the crown jewel of the mountains and the legacy of its founder, George W. Vanderbilt. Take a tour of the 250-room chateaux surrounded by the rolling mountains of the blue ridge, stroll through gardens masterfully landscaped by Frederick Law Olmsted, and visit the winery in Antler Hill Village for a free tasting. There are also museum exhibits, outdoor adventures, and activities for the kids. The beauty of the Blue Ridge has compelled travelers to return to western North Carolina time and time again, and Asheville offers easy access to the multitude of outdoor adventures in the area. Take in the breathtaking scenery along “America’s favorite drive,” also known as the 469-mile Blue Ridge Parkway, which leads to many of the hiking and biking trails that dot the landscape. Dip your toes into the base of a cascading waterfall, find your perfect spot to go fly-fishing, or soar across the canopy along one of the many zip-line adventures located throughout the mountains. In Asheville, the central hub of mountain culture can be found in downtown. You can explore the many boutiques, independent bookstores, outdoor eateries and art galleries, catch the sunset from one of the many rooftop bars, and watch buskers as they fill the streets with lively music and performances. If you’re in town on Friday night, be sure to visit the lively drum circle, a long-standing tradition open to everyone who wants to join in. Learn more about the city’s unique history by taking a walking tour of the Urban Trail, or jump aboard one of the many trolley or bus tours. Asheville’s drool-worthy food scene is chock-full of incredible places to eat. The hardest decision you’ll have to make is where you should dine. One strategy is to try small plates from multiple restaurants by signing up for a walking food tour, or go one step further, and visit where ingredients are sourced by taking a foraging expedition, a farm tour, or by visiting a local creamery along the WNC Cheese Trail. Wash it all down with a heady pint from one of the many local breweries around town. Asheville’s music culture has roots firmly planted in bluegrass and old-time mountain sounds. Put on your dancing shoes and head to downtown for a free Shindig on the Green concert, or plan to attend the longest running mountain music festival in the nation, the Mountain Dance and Folk Festival. Asheville is also home to numerous stops along the Blue Ridge Music trail, which connects you with festivals and concert venues throughout the region.